Even through my exhaustion I continue to see God's blessings and faithfulness. This week has been such a good one! Again today I had another crazy run around kind of day! Makenzie is finally feeling much better. She is draining which stinks but at least it is coming out! The last 2 days she has decided to catch up on her sleep and I have had to wake her up in the morning. Not the best couple of days for her to decide to do this but we made it work! Makenzie did amazing in therapy today! Her therapist took a look at her new braces and by the end of the session both she and I were confident that they were helping a ton! Most all of her flextion pattern starts in her feet and the braces took that away so that she can now work on using the right part of her body to move! Go Kenzie! While Makenzie was in therapy I got a call from the intake teacher for the homeschooling program. We began talking and I told her a little bit about what the special ed teacher and I talked about yesterday. One of my biggest concerns and areas that I want to address on the IEP is the amount of time Makenzie is going to spend physically sitting down with their curriculum. She told me that lots of things were learning experiences and that even doing things with Makenzie like baking a cake and letting her help me measure the ingredients would count. When she said this I chucked a bit. The next words jokingly spoken .... "you don't know very much about Makenzie ... do you?" "No... that is why I am calling." Ah why of course... LOL!!! So I gave her the two sentence in one breath answer.... " In 2007 Makenzie choked on a cracker and went without oxygen. This caused a serious global anoxic brain injury and as a result she has been diagnosed with Quadriplegic Cerebral Palsy." Short simple and to the point. "I think I know of you! Your daughter choked on a goldfish cracker right?" "My husband was on that call. He came home and told me about your daughter and for a long time he would not allow me to buy goldfish crackers for our kids." "For he will command his angels concerning you to guard you in all your ways; they will lift you up in their hands, so that you will not strike your foot against a stone. "Because he loves me," says the LORD, "I will rescue him; I will protect him, for he acknowledges my name" (Psalm 91:11,12,14). Even though that doesn't seem to be enough I am so thankful for what you and your family have done for me and my family! 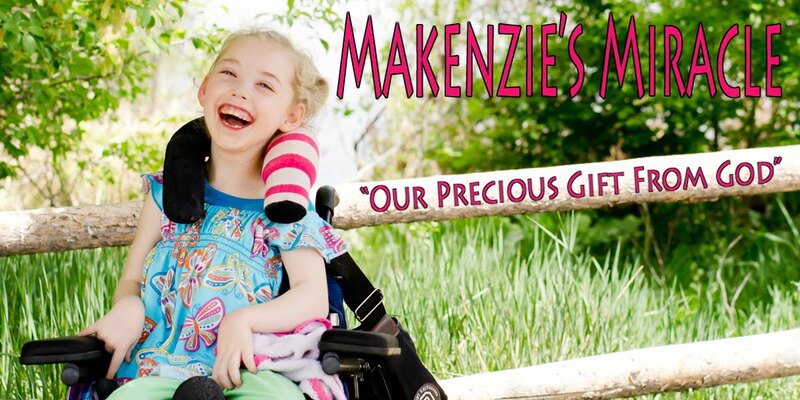 Thank you for being Makenzie's Angels on earth! There will be no surgery! Today was a GREAT day! God is so good!